Hackers have subverted the domain name system (DNS) records that link site names with Internet Protocol (IP) addresses for Google's Palestine domain, and put up a defaced home page with an anti-Israel message. The attack took place earlier this morning, but it's not known how it happened. An Arab-language forum, hackteach.org is linked to from the defaced Google.ps home page, and describes itself as the "Network wrath of Palestine 2013-2014". The hackteach site also contains discussions threads on DNS hijacking and google.ps being breached and is currently being served up for Australian users from Cloudflare's network in Sydney. 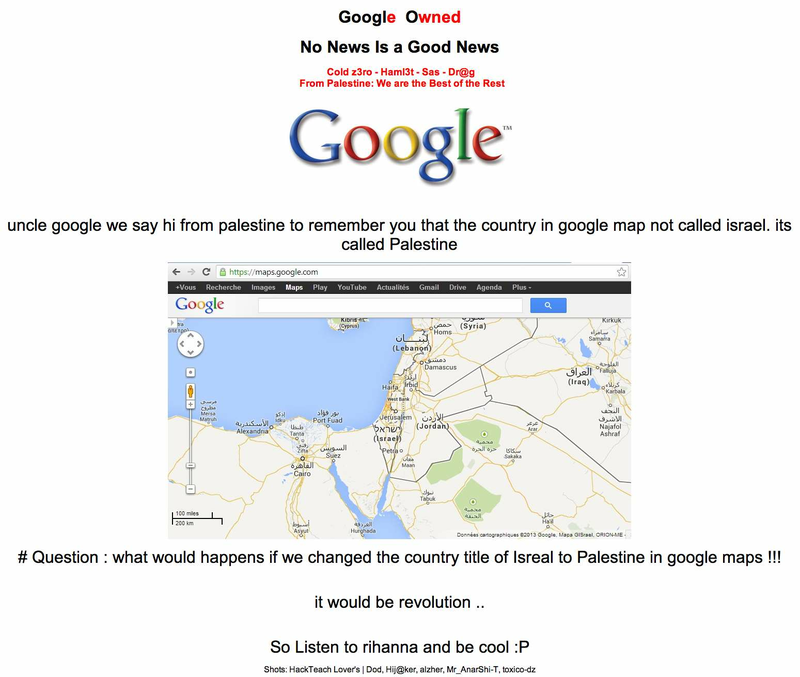 The defaced Google Palestine home page. As of writing, Google.ps was being served up from a network operated by Genious Communications in Marrakesh, Morocco. However, a DNS trace by iTnews showed that the registered name servers for the domain as per whois data still return an answer with an Internet Protocol address on Google's network for google.ps. Google has not provided any official comment on the hack.